I have always been fascinated by the intersection of science and spirituality. Not in the way the two clash as in the vitriolic, polarizing, and often political right/wrong arguments over evolution v. creationism, but in the way they come together like in Deepak Chopra’s book The Tao of Physics or the popular film from 2004 What The Bleep Do We Know? I recently had another experience that brought these two seemingly different worlds more closely together. You might think that the content of the two books would be remarkably different, but each book is, in essence, asking “What is the nature of consciousness?” What struck me is that while on the surface their conclusions are different it is remarkable how similar, at core, the two books are. Consider the title of the first chapter from each: “The Voice Inside Your Head” and “There’s Someone In My Head, But It’s Not Me”, or the following content: “There’s a voice talking in your head. Why is it talking? It’s you who’s talking, and it’s you who’s listening…When the voice argues with itself, who it is arguing with? Who could possibly win?” and “How is it possible to get angry at yourself: who, exactly, is mad at whom?” If I didn’t tell you that in both cases the first comes from The Untethered Soul and the second from Incognito I think you would be hard pressed to venture anything more than a guess. Incognito is ultimately a book that is disarming in its reductionist approach to the complexities of human behavior. Eagleman presents a very compelling argument that reduces conscious behavior to an arbitrator between neurologically burned-in sub-routines that are conflicting. 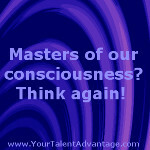 Our consciousness is reduced to a negotiator between incongruent sets of behavior that cannot occur at the same time. He makes a compelling argument that we are far more these “zombie” routines than we would care to admit or possible even consider. The Untethered Soul takes a different tack and moves in the opposite direction. We are, according to Singer, nothing more (or less) than pure consciousness. The swirling mix of emotions, reactions, behaviors, and dialogue in our heads are but distractions from this spiritual connection to consciousness itself. I am known to see connections of profound consequence (to me) that baffle those around me, but there is in these two explanations a connection for me. Ultimately, both authors are saying that our consciousness is all that we can know about ourselves. Eagleman’s science proves that most of what we do, know, and think is driven by chemical processes or unconscious neural routines that are unknowable to us. Singer, on the other hand, posits that much of what we do, feel, and think are distractions that keep us focused on the unimportant. In the end both strike a blow to the inflated sense of ourselves that our busy conscious minds bolster on a daily basis. Both conclude that our belief that we are masters of our own destiny is, at the least, highly suspect. While the two start at the same point, consciousness, their explorations into the subject take them in different directions. Eagleman is explaining the biology behind how our consciousness is responsible for just a very small fraction of who we are while Singer is providing a spiritual path for living with this knowledge. In the end I find comfort and fascination with both directions. This entry was posted in Leadership and tagged Pure Consciousness, Science and Spirituality, Sense of Self, Spiritual Path, The Nature of Consciousness. Bookmark the permalink.